Do you have pollen allergy symptoms? How can you tell? Pollen is small grains from plants. These grains help the plant to reproduce. Some pollen has to be transferred to other flowers. The pollen carried by insects in larger and stickier. It is unusual for people to be allergic to this kind of pollen. It is the pollen carried on the wind that causes most pollen allergy symptoms. This pollen comes from rather plain looking plants like common ragweed. The pollen they make is very small, light, and dry. It is carried easily on the wind. It can drift for many miles. Plants produce pollen in huge quantities. The common ragweed plant can produce a million grains of pollen each day. Pollen is produced in mass quantities, it can drift on the wind for miles and the plants are widespread. This means that no one can really escape from the pollen. It will be everywhere. It gets in our clothes or in our pet's fur and we bring it inside our houses. We open the windows and it comes into out houses. We ride in our car and it gets in our cars. Ragweed isn't the only plant that produces pollen we are allergic to. There are many weeds, trees, and grasses that also produce pollen. These are just a few of the plants that make pollen that causes pollen allergy symptoms. We suffer from pollen allergy symptoms seasonally. The same plants bloom at the same time each year. The further north you go the later the season will begin. 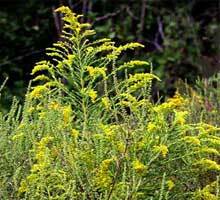 Common ragweed season begins in early July and last until the middle of August. Many weather reports now include a pollen count during the news. This tells us how much pollen is in the air. It is measured by the number of grains of pollen in a square meter of air over a 24 hour period. It is not exact but we can use it to get an estimate of the pollen level for the day. Pollen is highest on warm, dry, breezy days. Pollen is lowest on chilly and wet days. As of now there is no cure for allergies. 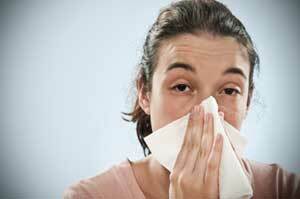 There are some guidelines to follow reduce allergy symptoms. Complete avoidance of allergens is the best way to prevent pollen allergy symptoms. However, unlike food, drugs, or pets you can't avoid pollen. Try to stay indoors on days with a high pollen count. Avoid other irritants like dust, aerosol sprays, tobacco smoke, paint, air pollution, etc. Medicine is available to help to reduce the symptoms of an allergy to pollen. Pollen is everywhere. It is almost impossible to avoid. If you are one of the people unlucky enough to have pollen allergy symptoms, like me, what can we do to help lessen our allergic reactions. No one perosn can control the outside air, but we do have some control over the air in our houses. Using a good quality air purifier can help to reduce the pollen inside you home. We have used an air filter for many years now. We can tell an almost immediate difference when we come inside. During hay fever season, we have watery eyes and a runny nose. Lots of sneezing, too. Once we get inside, it all goes away very quickly. Some days it seems like only minutes before we can breathe again. Since we begin using a purifier, we usually don't have to take medicine at night to sleep. We only need medicine sometimes. We only take it if I am going to be outside all day. 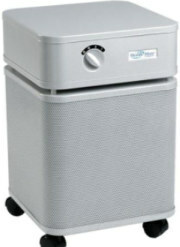 So if you want to reduce your pollen allergy symptoms, use an air purifier. We recommend a HEPA filter for those of you with allergies. This will filter out almost all the pollen from the air. It will also filter out other irritants for you as well. Please don't use a air purifier that produces a lot of ozone. Ozone is harmful and can make your symptoms worse.